What better way to spend your chosen day of the week standing in the Whiteadder fishing for spring salmon and early summer sea trout knowing that you have salmon fishing costing you from as little as £8.33 for a weekday and£10 for a Saturday rod. 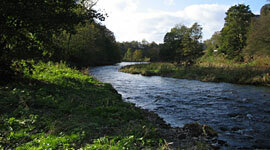 Bluestone Fishery on the Whiteadder, a main Tweed tributary is now offering anglers this opportunity. The expression that Bluestone has been lightly fished in the past is no exaggeration as can be seen from statistics of days fished annually in recent years.The typical pattern sees a run of spring salmon from early in the season, through March and April into May. From May and through June there is additionally a good run of sea trout, which in low water are best fished for at night, but in a slightly coloured water after a rise in levels good catches can be had in daytime. Bluestone Fishings are approximately four miles above the tidal reaches. The Whiteadder rises in the Lammermuir hills and passes through the Whiteadder reservoir, which has a stabilizing effect on river levels in periods of high rainfall and drought. So if your looking for affordable syndicate fishing for up to 18 weeks, if purchased now, there are now limited rods available for week days and Saturday. Week days are £150 and Saturdays are £180. The syndicate runs from now until 30 June 2012, people booking now would get 18 weeks of fishing which works our at just £8.33 weekday and £10 Saturday.